When your veterinarian prescribes a medication, he or she can dispense it in a safe manner, ensuring your pet has had any recommended screening performed, looking out for drug interactions, and keeping the product in an appropriate manner. This does not always happen with online pharmacies. The FDA says, “buyer beware” about online pharmacies. There has been much concern about the quality and authenticity of drugs that can be obtained online. If you have a problem or question, your veterinarian is able to address it directly. Not all veterinary pharmacies can claim the same. Websites that sell prescription veterinary products without the need for a prescription are breaking the law, plain and simple. If they are ignoring the law in this respect, where else are they cutting corners? Many drug company warranties such as those for heartworm prevention are invalidated when the product is purchased through such venues. Talk to us or to your veterinarian. He or she truly has your pet’s best interest at heart. And you may be able to walk out the door with your pet’s medication for little more than ordering online. Our on-site pharmacy is well stocked and able to fill prescriptions before you leave. We are also a compounding pharmacy which means that we can tailor your pet’s medication to their unique needs. This gives us the ability to adjust the dose and method of delivery or to offer solutions for pets that are difficult to medicate, such as adding flavors or ordering transdermal medications. Talk to us or to your veterinarian about the options they offer. Sometimes convenience is not worth the risk, and your pet’s medications fall into that category. Be sure that your pet has access to water. Just because it is cold out doesn’t mean hydration is not necessary. Don’t forget that many water sources freeze in the winter. Pay attention to the paws! Your pet’s paws may become sore or even cut when walking on frozen ground and ice. You might consider investing in some protective doggy boots if trekking for long periods in these conditions. Many ice-melting products are not pet-friendly! Use a pet-approved product for your own property and be sure to clean any potential contamination from your pet’s fur and paws upon your return home. Steer clear of antifreeze. Even a tiny amount of this sweet substance can be lethal. Be extra careful around frozen lakes and ponds. If your pet should fall in accidently, it may not be able to get out. Hypothermia is also a concern. Use extra care in icy areas for both you and your pet. If your pet begins to shake or shiver, it is time to end your outing. Just because your pet is wearing a fur coat doesn’t mean it can’t get cold. Just like you, the more active your dog is, the warmer it will stay. Your pet may benefit from wearing doggy booties or a coat. Try to target your outdoor activities for the warmest part of the day. There is a big difference between going for an hour long walk at noon and walking in the evening after the sun has gone down! Don’t keep your pup all cooped up until Spring! By getting out, you will enjoy the season and keep you and your pet healthy and fit. Just be aware of weather-related dangers so that you can head outdoors worry-free. While the poinsettia plant is perhaps the most infamous holiday plant, its reputation is not entirely deserved. Its extreme toxicity is largely an urban legend. The plant is mildly toxic and irritating to the mucous membranes. While it is unlikely to cause severe illness, it is probably best to keep this plant out of reach. The level of toxicity of mistletoe largely depends on the variety, but the berries of both the American and European variety cause stomach irritation at small doses. At larger doses, it can trigger much more serious problems (including low blood pressure, seizures, and disorientation). Eating holly can result in severe stomach upset in dogs and cats. Signs that your pet has eaten holly include smacking of lips, drooling, head shaking, vomiting, diarrhea, and loss of appetite. Lilies are very popular around the holidays, but they are deadly for cats. Ingestion causes severe stomach upset, heart arrhythmias, kidney failure, and death. Don’t discount the tree! The oils and sap can be irritating to the mouth and stomach, which can lead to drooling and vomiting. 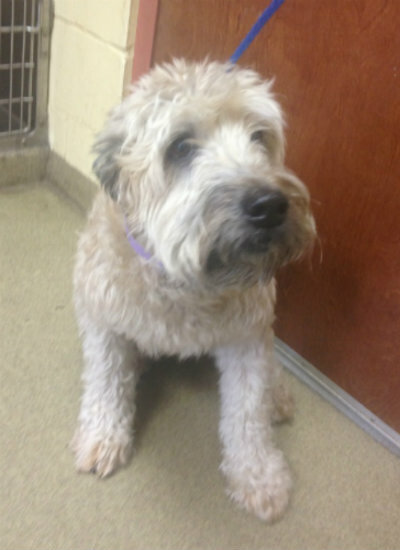 Grooming at Elmhurst Animal Care Center – Bow Wow Wow!!! Does the groomer personalize services? For instance, certain pets may require special shampoos for itchy skin, have trouble with their ears, or need their coat trimmed a certain way. Our groomers are willing to groom to your pet’s needs, not a one-size-fits-all template. Does the groomer require proof of vaccination? Requiring vaccinations protects your pet. Be wary of any establishment that does not ask for this information. We require all vaccines to be documented and current at the time of your appointment. Does the groomer know you and your pet? Many groomers turn and burn through many pets a day and don’t have time to get to know each client. After a grooming session or two, your pet should be greeted by name! Does your pet get treated like the prince/princess s/he is? Likewise, when a groomer has many pets to groom in a day s/he is unable to take the time to pamper your pet. Our groomers take pride in treating each individual pet to a spa day, taking time to allow even nervous pets to relax and enjoy themselves! What kinds of hours do they keep? Do you have to work around the groomer’s schedule or do they work with yours? We are happy to work around your day care or boarding schedules. Can they accommodate special requests? Do they have a working knowledge of your needs? If you have a show or performance pet, it may need to be groomed in a certain manner. 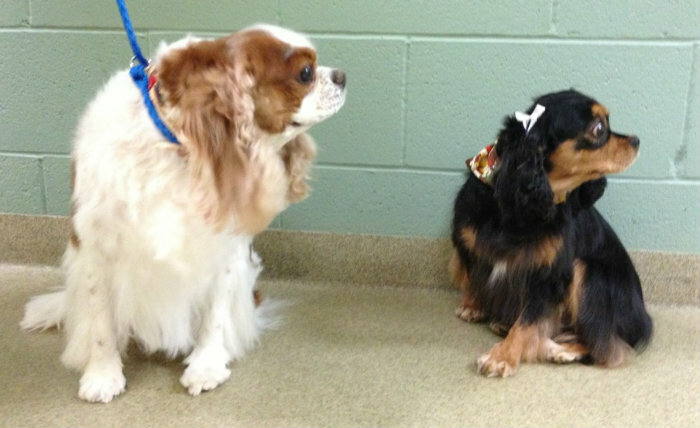 Does your groomer have an in-depth knowledge of your needs? Thinking of changing up Fluffy’s look and going with a pink coat? Can your groomer accomplish that? Be sure to ask! What happens if the pet needs medical attention? Injuries and accidents can happen, particularly if you choose a groomer where care and experience are lacking. In the unlikely event of a problem, Elmhurst Animal Care Center has veterinarians on staff that can immediately attend to your pet. It is also convenient to have a veterinarian around so that any minor medical issues can be addressed during your pet’s grooming appointment. Elmhurst Animal Care Center is proud to have an experienced, caring grooming staff to attend to your pets. We hope that you trust us with your grooming needs. Because a picture is worth a thousand words, here are just a few to help you see what a great job we do! 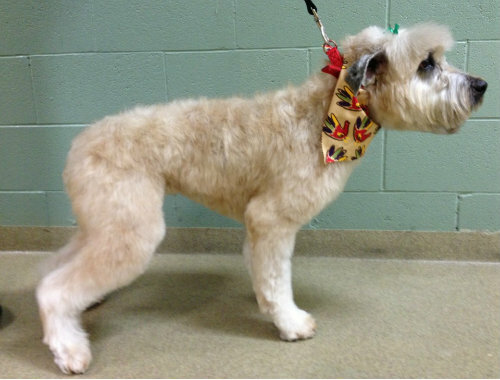 Lucy After Grooming – Bow Wow Wow! 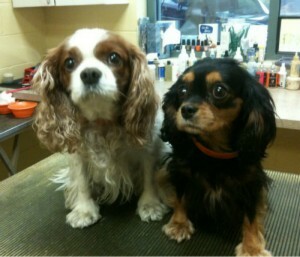 Ernie & Daisy After Grooming – Woof! !